Angus-based Falklands veteran Tony Banks has been appointed to the post of Honorary Colonel of the Territorial Army’s 71 Engineer Regiment (Volunteers). Mr Banks, who has featured in reality TV show Secret Millionaire, is owner and founder of Scottish care provider Balhousie Care Group. The regiment is based across Scotland, with TA Centres in Elgin, Kirkwall, Paisley and Cumbernauld, with its headquarters at RAF Leuchars in Fife. As the only Royal Engineer unit in Scotland, the regiment’s role is to provide military engineering support to both regular engineer units army wide, including in Afghanistan, and the TA’s Scottish units. Like Mr Banks, several members of the Regiment have seen active service. Mr Banks was chosen for the post because of his own military background, business experience and philanthropic work, which includes supporting Combat Stress, a charity which helps ex-servicemen and women affected by post-traumatic stress disorder. His role as Honorary Colonel will see him acting as an ambassador for the TA, building links with businesses and the community and offering professional advice on issues such as recruitment. Captain James Bryce, Adjutant of 71 Engineer Regiment (Volunteers) said: “We are delighted that Tony has accepted the post of Honorary Colonel. As well as being a prominent business leader, he has a military background and saw active service during the Falklands War.” he said. 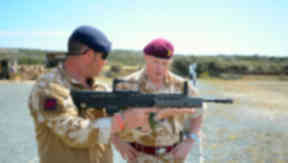 Mr Banks signed up for the Territorial Army Parachute Regiment and then joined 2 Para, which saw him being deployed to the Falklands 30 years ago. His company Balhousie Care Group, founded in 1991 and headquartered in Perth, is now Scotland’s largest independent care home operator, with 24 homes across the country caring for up to 860 residents.